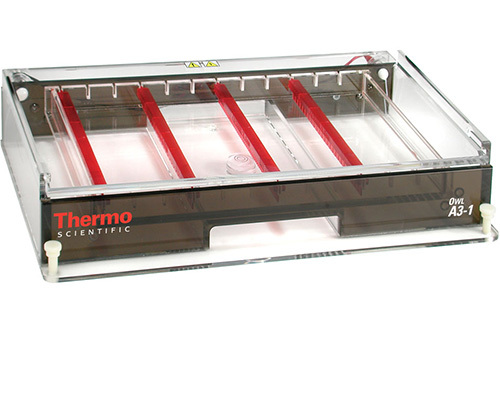 The Owl A3-1 Wide Gel System can run from 25 to 600 samples on one gel. The gel can be cast in varying lengths to help conserve agarose when fewer samples need to be run utilizing a wall comb. This unit comes with built in buffer exchange ports to allow for buffer recirculation on extended runs, if needed. The large number of comb slots gives you sample and resolving distance flexibility. Ships complete with Buffer Chamber with Three Point Leveling Base, SuperSafe Lid with Attached Power Supply Leads, U.V. Transmissible (UVT) Gel Tray with Gasketed End Gates, Built in Buffer Exchange Ports, 4 Combs: (2) 25 Well and (2) 50 Well, 1.5 mm Thick.